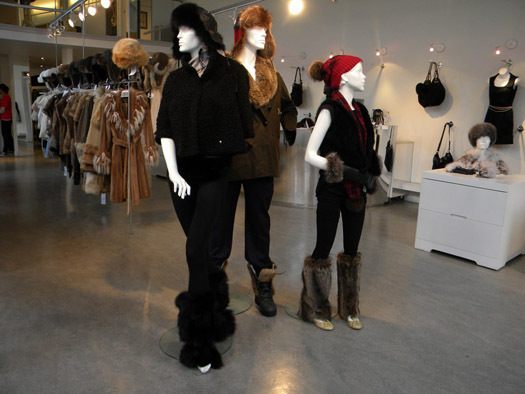 MONTREAL, Oct 3, 2010 / FW/ — It was last March when I first met Mariouche Gagné and all I remember is her enthusiasm for what she does – recycling old furs by turning them into new fashion apparel. The concept is simple, the execution is just beautiful – extend the life of fur coats, silk scarves, cashmere scarves and wedding gowns by transforming them into new unique pieces. It was like giving these items a second life and thus proving that fashion can also be sustainable. But as most first meetings are, my interview with Mariouche last March was like a whirlwind – a tour of her store and atelier and a long lunch where we discussed her line Harricana Par Mariouche and other fashion related topics. And like the proverbial visitor to a rose garden, I saw the roses but never smelled the flowers. In short, for my first visit, everything was so new and it was so short, I never had the time to internalize and appreciate what Harricana Par Mariouche was all about. Visiting the Harricana Par Mariouche location at Saint-Antoine Street in Montreal for the second time, I missed designer and entrepreneur Mariouche Gagné by a few minutes. Because of a prior appointment, our group was late getting to her atelier and though Mariouche waited for us as long as she could, she could only stay a few minutes to say hello and then leave for another appointment. And though it was an unfortunate situation, it also turned out to be providence. Mariouche Gagné might not be around to tell us about her collection, but it was the collection who “spoke” to us. Since 1994, Harricana Par Mariouche has recycled more than 50,000 fur coats and turned them into new branded creations, adding up to nearly 400 metric tons of refurbished fur, which by the way is estimated to have saved half a million animals’ lives saved. Interestingly enough, one of the members of our group is a vegan and as expected, does not approve of killing animals for fur. Yet, in the grand scheme of things, Harricana Par Mariouche has saved thousands of animals by working with fur! This sounds ironic to the politically correct, but to me, I see it as part of keeping a balance. Politically incorrect or not, I understand why fur exists in high fashion and I support what Harricana Par Mariouche is doing. Whether we like it or not, there is a demand for fur and it has to be filled. And I would rather see it filled by an ethical company like Harricana Par Mariouche who truly cares about ecology.